Enjoy great sky scenes on the mornings of January 10-12, 2018, as the moon joins up with the planets Jupiter and Mars in front of the constellation Libra the Scales. 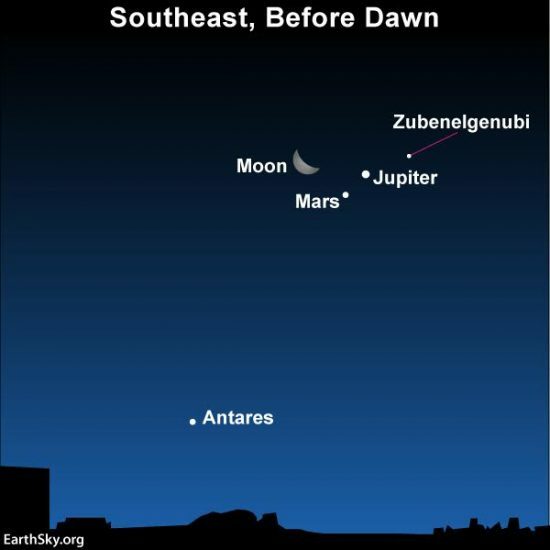 Before sunrise on any of these mornings – January 10-12, 2018 – let the waning crescent moon guide you to the planets Jupiter and Mars. You’ll be able to tell which planet is Jupiter and which is Mars, because Jupiter is much the brighter of these two worlds. The king planet Jupiter outshines the red planet Mars by about 20 times at present. In fact, you might miss Mars if you rise too late. That’s because Mars fades from view before Jupiter does as dawn comes. On the other hand, if you’re out before dawn’s first light (90 minutes or more before sunrise), you can easily spot both Mars and Jupiter. Both now lie in front of the constellation Libra the Scales. You might also notice a little star near the planets. It’s Zubenelgenubi, the alpha star in the constellation Libra the Scales. Aim binoculars at Zubenelgenubi to see that this star is actually a double star – two stars in one. 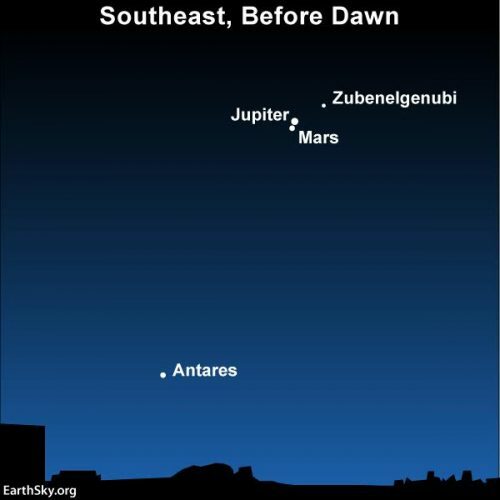 Here are Mars, Jupiter and 2 bright stars as they appeared Sunday morning, January 7. The stars are Zubenelgenubi in the constellation Libra the Scales, and Antares in the constellation Scorpius. All this week, although the planets will be drawing farther apart, you might notice these 2 stars near the planets. These are the planets on Thursday morning – January 11, 2018 – as seen from North America. From all around the world, this date is a great one for viewing the planets and moon! 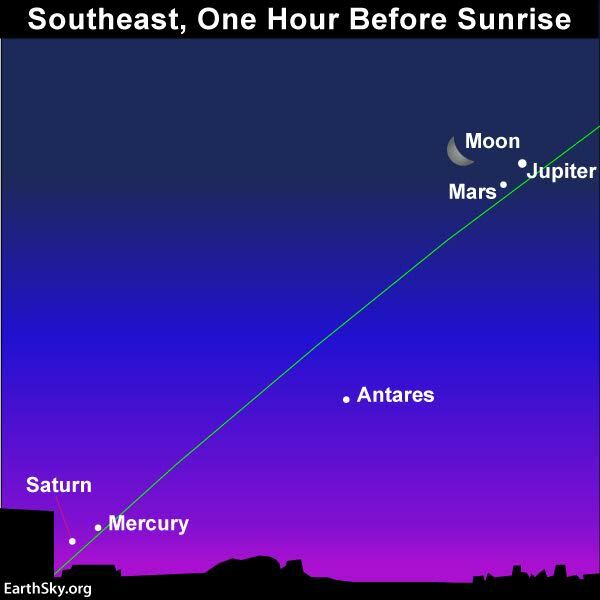 This chart also shows January 11, and it shows something else you might see before dawn this week. Jupiter and Mars will be easy, but Mercury, and especially Saturn, will be tougher. Watch for them as the predawn darkness gives way to dawn. Binoculars will come in handy! 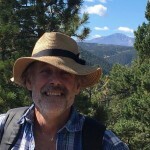 Click here for recommended sky almanacs; they can give you the rising times of all the planets in your sky. Zubenelgenubi sits almost squarely on the ecliptic – Earth’s orbital plane projected outward onto the constellations of the zodiac. Another way of looking at it, the ecliptic marks the sun’s yearly path in front of the backdrop stars. The sun has its annual conjunction with Zubenelgenubi on or near November 7 year after year. If you were born at the end of the first week of November, Zubenelgenubi is your birth star! The moon will leave the constellation Libra and enter the constellation Scorpius – with its brightest star Antares – later this week. But Jupiter and Mars will continue to light up the constellation Libra throughout January 2018. Mars will pass into Scorpius before the very end of January 2018. Jupiter – which orbits the sun farther out in our solar system, and so moves more slowly in front of the stars – won’t move into Scorpius until November 2018. That means you can use Jupiter to locate the constellation Libra for many months to come! Bottom line: Enjoy great sky scenes on the mornings of January 10-12, 2018, as the moon joins up with the planets Jupiter and Mars in front of the constellation Libra the Scales.